Railpictures.ca - Paul Santos Photo: A snowy day on the old fuel stand has a CP SD40-2 with big brute 6000 horsepower AC60W CSX 687. The twin lightning stripes by the cab number on the CSX unit indicates AC power. | Railpictures.ca – Canadian Railway Photography – photographie ferroviaire Canadienne. 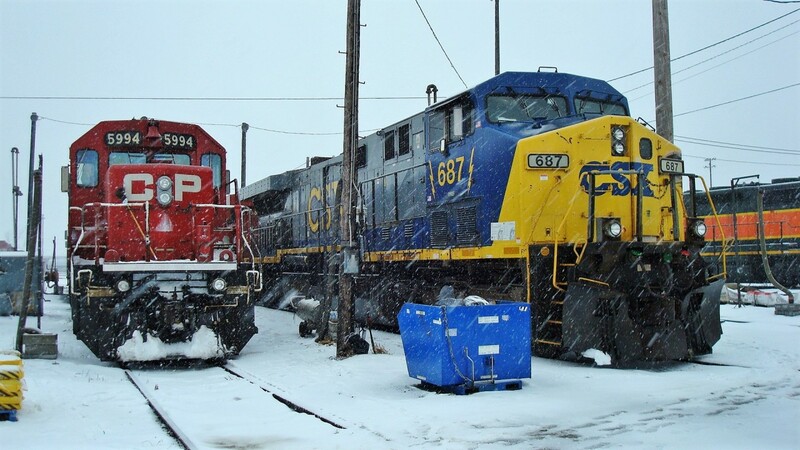 Caption: A snowy day on the old fuel stand has a CP SD40-2 with big brute 6000 horsepower AC60W CSX 687. The twin lightning stripes by the cab number on the CSX unit indicates AC power.